Are African footballers more likely to die on the pitch? 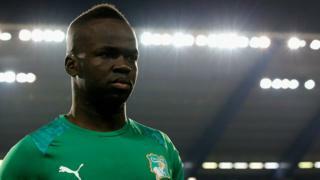 The recent death of Ivorian footballer Cheick Tiote on the pitch brought an outpouring of sadness in the world of football. This left us asking if there is any evidence to suggest that African players are more likely to die on the pitch than other players, writes Jordan Dunbar. In the past few years there have been a number of players who have died while playing football. Perhaps the most high profile incidents involved two African players; Cameroonian Marc Vivien Foe, who died during a game, and Congolese Fabrice Muamba, who had a cardiac arrest on the pitch but survived. There is no official register of people who have died playing football. So instead we have used a list from Wikipedia as, though not ideal, it is the most complete we could find. And we are looking at people who died playing the game, that is either in training or during a match. Robert Mastrodomenico from Global Sports Statistics has done some calculations to give us a rough estimate. Restricting himself to the last 10 years he found that 64 footballers had died during that period, but said it was not easy to figure out what all their nationalities were. This means this list certainly has its limitations, and yet, he persevered to crunch the numbers and we think it still shows something interesting. The analysis suggests that 26 of the 64 players who have died in the last 10 years are from African countries. That is nearly 40%. Fifa, football's world governing body, estimates that there are about 265 million people playing in recognised teams around the world. Around 17% of those are playing in Africa. That is not an ideal measure as many African players are in leagues in other continents. But it is a useful benchmark. Therefore, while Africans make up 17% of the world's footballers they account for nearly 40% of the known deaths. Overall, the biggest cause of death of footballers on the pitch was sudden cardiac death and this was particularly true for African players, as 25 of the 26 died from this cause. Could African players really be more susceptible to sudden cardiac death? Professor of cardiology Sanjay Sharma told the BBC that evidence from the US shows that sudden cardiac death amongst black basketball players is around three times more common than for white players. But, he added, that is not the only place he has seen that pattern. "There is data from the National Collegiate Athletic Association in the US that shows that the overall risk of sudden cardiac death during sport is around one in 48,000. "But when someone actually examines this more closely that risk is considerably higher in black athletes; one in 18,000 in black males." Professor Sharma said that in the UK the Football Association has done research on young players. The death rate for white footballers in that sample is one in 25,000 but it is one in 4,000 for black players. In other words, a black player is about six times more likely to die than a white player, though the chances are still very small. "The precise reasons aren't clear," said Prof Sharma. But he thinks that the evidence he looked at suggests black sports players are more likely to suffer from cardiac arrest because the wall of the left side of the heart seems to thicken more than players of other ethnicities. "Which may be a situation that causes abnormal electrical disturbances that can cause a sudden death." Professor Sharma said this can be made worse by higher blood pressure during exercise. Most of Prof Sharma's research has looked at black players in the US and UK. But it turns out the picture is more complicated. "There is going to be some genetic variation amongst the black population. Our information in the UK and from the US is based predominately among black athletes who have originated in West Africa." Prof Sharma added that while we do not have much data on East Africa, what we do have seems to indicate players from there do not suffer as badly as their West African counterparts. Heart screening is rarer in poorer African countries so problems in players do not always get picked up. "Overall the risk of sudden death is one in 48,000 to one in 50,000." The answer to the question "are more African football players dying?" is "perhaps". The lack of good data, the national and ethnic differences, as well as not enough monitoring means it is too difficult to give a definitive answer. But the medical research seems to suggest that there are good reasons to think that this is a serious issue. Am I more likely to get cancer because I'm tall?